HR professionals rely too much on formal training for leadership development. More strategic ways of learning and experiences outside the norm will help create future leaders. While study after study shows that increasing leadership capacity remains at the top of most firms’ strategic priorities, the same reports find that most companies’ leadership development efforts fail to deliver on expectations. HR professionals must rise to this challenge by not only reinventing their leadership offerings, but also by stepping up to leadership themselves. No longer able to limit their contribution to driving results within functional silos, managers at all levels must update their skillsets so that they can anticipate and lead change. My research on the challenges people face in stepping up to these bigger leadership roles reveals the pitfalls of prevalent leadership development approaches, and offers an alternative for HR professionals striving to help their companies – and their function – attain the leadership strength they desire yet find so elusive. The way we design and implement leadership development efforts flies in the face of what we know about how adults learn and change. We rely too much on formal training and our courses favour introspection over necessary experimentation. New research by the CIPD, for example, shows that while HR leaders subscribe in principle to the traditional 70:20:10 approach to leadership development (based on the idea that 70% of learning results from on-the-job experience, 20% from learning from bosses, coaches and mentors, and 10% from formal training), they tend to focus on the 10% formal training, as if the more critical on-the-job learning will happen automatically. 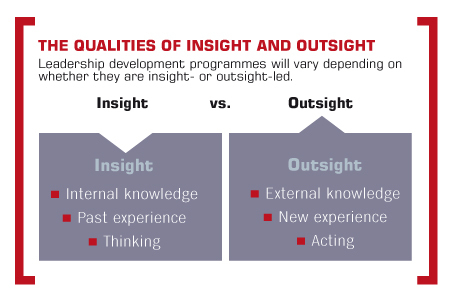 Most formal leadership courses focus on inner work – reflecting on past behaviours, analysing 360-degree evaluations, diagnosing leadership styles and planning out action agendas – when research tells us that too much introspection anchors us in the past and amplifies our blind spots. If “adults are more likely to act their way into a new way of thinking than to think their way into a new way of acting”, as Richard Pascale tells us, then a radical overhaul of the way we develop leaders is called for. A more effective approach to leadership development is based on a wealth of research showing that the way we act drives the way we think – and not the other way around. The key is to increase ‘outsight’, which I define as the fresh, external perspective that comes from doing new and different things and interacting with new and different people. It’s the opposite of learning by self-reflection, in which we seek insight on past behaviours. An outsight-centred approach to leadership development means returning to the 70:20:10 rule by helping executives to redefine their activities and relationships first, before we ask them to rethink themselves in the classroom. Try to make jobs more strategic, as most managers allocate too much time to routine operations. They need to redefine their jobs away from the expert or functional work they have excelled at in the past in order to contribute more strategically. In a recent survey I conducted with my executive education alumni, participants reported that among the things that helped them to develop a strategic view of their work was ‘experience in an internal project outside my usual responsibilities’. They also said, however, that these stretch experiences were hard to come by, and that their bosses kept them shackled to the same old work because they were “too useful” there. We know that people learn most by being thrust into cross-functional projects, international assignments and taskforces set up to tackle strategic issues. For example, a global product launch can provide exposure to senior leadership, and a cross-functional project may open doors to new career opportunities. Indeed, in a Catalyst survey of more than 4,000 MBA graduates from top business schools, 62% reported that assignments that cut across lines of business, hierarchical levels, and functional specialities – what they called ‘hot projects’ – had the greatest impact on their careers. Fixing a pervasive lack of access to such transversal projects and assignments requires a mandate from the top, incentives that discourage parochial ownership of leadership programmes (e.g. budgets that are earmarked for cross-boundary initiatives), and willingness from HR managers themselves to take on roles and projects that cut across organisational lines, so that they personally experience the value of doing so. Make networks more externally focused. One of the biggest reasons people have a hard time thinking and working strategically is that they get their information and support from a narrow range of usual suspects. To develop a more strategic view of their business or function, and then to obtain buy-in for their ideas from stakeholders across the lines, managers must diversify their networks beyond their immediate purview. While informal networks are just that (i.e. not something that can be mandated formally), there is much HR can do to foster cross-cutting relationships up and down the line. 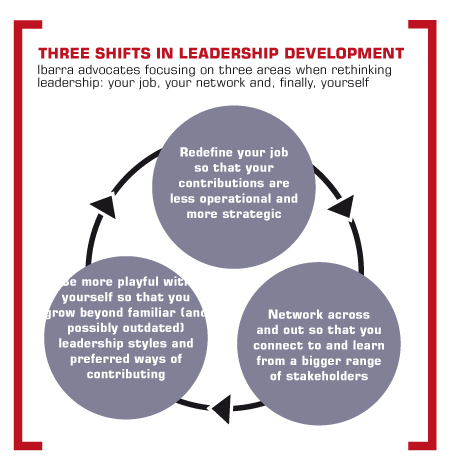 For starters, good networking is rarely included in the leadership competency models that prescribe an organisation’s recipe for strong leadership. Yet we know that networks differentiate effective managers who can deliver reliably on today’s tasks, from strong leaders who are able to sense new business trends and translate them into a sense of direction for their teams or units. Networks are sources of competitive intelligence, incubators for creative ideas, and the links through which support, talent and resources for our pet projects flow. But without careful curation our networks easily fall prey to what I call the ‘narcissistic and lazy’ trap – our tendency to end up with networks composed of people who are just like us or who we cross regularly in the course of our daily routines. Encouraging side projects, task forces, personal project time and extracurricular activities are the best ways to help leaders (including HR leaders) cultivate more diverse and strategic networks. That means thinking of assignments in terms of the relationships they will help forge. It also means that HR leaders need to be far more networked than they have been before, in order to better understand the array of possible developmental projects and to develop the strategic relationships they need to place people in them. Self-reflection should be towards the end of the programme. Some of the most popular leadership development efforts today aim to help leaders identify and leverage their core strengths, increase their self-awareness, and become more authentic leaders. While these goals are sound, they are largely insufficient for fostering the situational awareness and change leadership skills most prized by organisations today. Authentic leadership means very different things to different people: expressing how you really feel instead of putting on a show, being true to one’s values, or being transparent. In practice, however, for many of us it actually describes ‘being as I have always been’. But moving into a bigger leadership role almost always requires people to act against their natural inclinations. That’s why, paradoxically, exhorting managers in transition to be more introspective can backfire, encouraging them to stick with comfortable behaviours instead of growing new capacities. Take, for example, the shift from having good ideas to being able to sell them to a broad and diverse set of stakeholders. Many inexperienced leaders find the process of getting buy-in distasteful and ‘inauthentic’ because it feels artificial and political; they believe their work should stand on its own merits. They lack persuasive skills not only because they lack the skillset but also because they are not sure they want to be the kind of person that behaves that way. By helping people develop new experiences and relationships first – before we ask them to self-reflect – we help them gain the necessary outsight on what it means to lead in their specific situation, what kind of leader they’d actually like to become in practice and why stretching way outside their comfort zone and former ways of being authentic is not only worthwhile but indicative of personal growth. Change thus becomes grounded in direct experience and new self-definitions, and, therefore, sustainable. Preparing the organisation for the future inevitably means disrupting the present. By the same token, changing the way a company develops its leaders requires leadership work and therefore outsight. Applying the outsight principles outlined here is harder than implementing self-awareness based learning and development approaches because, by definition, they happen outside the classroom and outside HR’s direct control. Sensing new trends in learning and development, raising urgency for doing things differently, challenging vested interests, aligning sponsors and champions, and setting a new course all mean making the HR job more strategic. It also means extending one’s network outside HR – connecting with the line managers who must buy into new initiatives and with opinion leaders outside the organisation to better learn about what’s new. If leaders remain relevant by continuously working to increase outsight on their jobs, through their networks, and on themselves, then HR leaders are no exception. They are as much in need of outsight as the executives they are helping to develop. This article first appeared on HR Magazine.